A face familiar to the OSA staff and to many throughout Iowa took over as State Archaeologist and OSA Director on July 1, 2007. John Doershuk will serve as the 6th State Archaeologist following such directors as Bill Green, Duane Anderson, and Marshall McKusick. He is replacing Steve Lensink who ably served as Interim Director since November 2005. John has been with the OSA since 1995, when he became the director of the General Contracts Program (GCP). The past two years he served as the Director of the OSA Contracts Division, overseeing both the GCP and the Highway Archaeology Program. John has had a longtime interest in archaeology beginning with inspiration from a high school history teacher in Cleveland Heights, Ohio, who herself had participated in archaeological field work in England. His teacher’s enthusiasm led John to take a field course following graduation from high school. The project, sponsored by the Cleveland Museum of Natural History, looked for subsurface features at a Hopewell burial mound, the Harness Mound Site near Chillicothe, Ohio. The experience “hooked” John on archaeology, so much that he stayed on the project an extra week as a volunteer and returned the next summer after his freshman year in college for 10 weeks as a paid crew member. His undergraduate years were spent at Carleton College in Northfield, Minnesota, and there he continued amassing more experience in archaeology. He worked on another Ohio project after his sophomore year, a systematic survey of Kelly’s Island in Lake Erie. The summer after his junior year, he took time to get married to Suzanne Guenther, another Carleton sociology-anthropology major, and then talked her into signing up with him for an NSF-sponsored undergraduate research experience in Greece with one of their Carleton professors. They traveled, on the grant, two months early to explore Europe as their honeymoon before settling in for the five-week archaeology project in Delphi. After graduation from Carleton, John entered the graduate program of the Department of Anthropology at Northwestern University, where he received his Masters and Doctoral degrees. Northwestern introduced him to the rich archaeology of the lower Illinois River valley and he joined the large Koster Site Project, completing his dissertation on spatial analyses of Archaic horizons from that site. While at Northwestern, from 1984 to 1990, he also taught archaeology and anthropology at Loyola University of Chicago. Soon after receiving his Ph.D. in 1989, he entered the consulting world with 3D/Environmental, Inc., a private sector firm in Cincinnati, Ohio. He advanced from a project archaeologist position to program director, and in 1995 the opportunity arose to take a similar position at OSA. 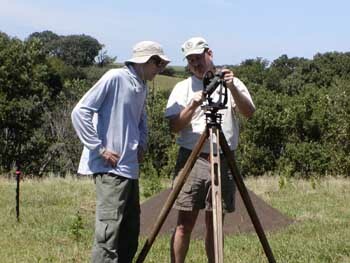 When asked what initially attracted him to OSA, John said, “I felt the constant emphasis on profit in the private sector as the motivating criteria for the archaeological work my program was doing limited our ability to do good research.” With the OSA General Contracts Program, “I recognized a different sort of opportunity—the chance to maximize the archaeological work that could be accomplished for the dollars available.” Working at the OSA also offered him the chance to teach and work with students. John says he has enjoyed working at the OSA and admires the positive impact former State Archaeologist Bill Green has had on Iowa archaeology. He said that was one of the reasons he wanted to be State Archaeologist, “to continue that positive influence and to contribute what I can to decision-making opportunities that affect Iowa and regional archaeology.” When asked about the strengths of OSA that led him to seek to become State Archaeologist, he emphatically cited the range of talent and experience among the staff. “The staff knows a tremendous amount,” he said, “we need to sustain this knowledge, not lose it.” He hopes to find ways to empower the staff to pursue archaeological projects that they think are important. John looks forward to working with the many different constituencies that the OSA serves. In particular, he values the members of the IAS, calling them the “first public,” people that already have knowledge of and interest in archaeology. He would like to expand public participation in archaeology. He also looks forward to working with professional archaeologists in the AIA, the various Indian communities, students and faculty members, and hopes to utilize varying means to enhance these interactions. He said he already has a meeting scheduled with another group, business leaders in Des Moines, hoping to inform them of archaeology’s interests and concerns. He hopes that increased public interest will eventually lead to significant gift income for OSA to supplement the support received from the University and the OSA’s robust contract programs, “the OSA already holds a leadership role, nationally and regionally, and increased support can enhance that role.” John reports he is impressed by the daunting array of potential facets that the job of State Archaeologist offers. He welcomes the challenges, feels energized by the potentials, but also recognizes that he cannot let himself be overwhelmed by all the details. This, he says, is his own personal challenge; he cannot be personally involved in everything. When asked if all his new responsibilities will enable him to actually do archaeology, to stay involved in the field that excited him years ago as a high school student in Ohio, he was cautiously optimistic. But he instantly became animated relating one of the topics that particularly interests him, understanding the spatial characteristics of distributions of artifacts within sites of any age—and that interest persists whether the site is an Oneota village, a Paleo-Indian bison kill, or a nineteenth century farmstead. His enthusiasm for all things archaeological bodes well for the new Doershuk regime at OSA.